and sometimes, it may not drain at all. When these problems occur, it is an indication that the drain is experiencing a problem and is either clogged or damaged in some way or another. In Ashland, Massachusetts, you can count on our service to provide you with the professional drain cleaning that will get your home back up and running again. The issues that many people experience when their drain is clogged is the fact that it can happen at the most inconvenient time of the day (or night). You may have noticed that it was draining slower than usual but suddenly, the entire system is clogged up and it becomes unusable. That is when you can contact us to clear the clogged drain, flush it properly and ensure that the problem is completely cleared. The following are some of the specific issues that we can fix. Shower Drains – This is a common part of the home where clogs can occur. After all, there is a lot of hair that tends to go down the shower drain, and it doesn’t take long before it begins draining slowly. It can be disconcerting to stand in the shower and realize that it is gradually filling with water. If it is clogged, that water may never go away. We can come in and clear the drain line, regardless of where the clog happens to be. Clogged Sinks – Another common area where drain cleaning may be necessary is in the sink. A lot of issues can occur in this area and sometimes, it may happen over time. In the kitchen sink, it could be a matter of the garbage disposal backing up or food that has gone down the drain and become lodged in the P-trap. We ensure that this issue is cleared up quickly and efficiently. Clogged Toilets – Although any type of a clogged drain could be problematic, a clogged toilet is something that could be catastrophic. Sometimes, the water may flow out of a clogged toilet, and it could lead to extensive damage to the floor underneath the toilet and anything in the home below that area. The damage could include wood rot, drywall damage and the possibility of mold. That isn’t even to mention the inconvenience of having your toilet unavailable. We can clear the drain, not only get it to flush but to keep it flushing like a champ. 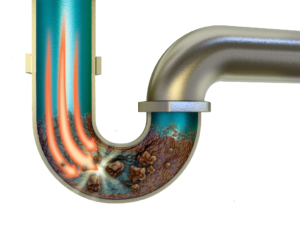 If you are experiencing any type of clogged drain, our drain cleaning service is precisely what you need. Contact us for more information, and we will come to your home quickly to get it back up and running again. There is nothing quite as inconvenient as having a clogged drain, but when you call us, you can rest assured that the problem will soon be history.